I hit my 3rd Twitter block last night, for one tweet noting "making science tribal isn't scientific" linking back to a post on work indicating peoples stated positions on things like climate change and evolution marks their membership in a herd, not their knowledge level, and another only linking to a twitter discussion in which the writer of the Slate article that seems to have generated all the attention was challenged on whether the situation in Syria was caused by climate change. A new study ... is the first to examine the drought-to-war narrative in quantitative detail in any country, ultimately linking it to climate change. “It’s a pretty convincing climate fingerprint,” said Retired Navy Rear Adm. David Titley, a meteorologist who’s now a professor at Penn State University. Despite the noted study being "new" and possibly a first, there's another study on Syria dealing with drought and war; one that provides a warning against the "it's all global warming's fault" narrative. I will argue that it was not the drought per se, but rather the government's failure to respond to the ensuing humanitarian crisis that formed one of the triggers of the uprising, feeding a discontent that had long been simmering in rural areas. Drought forms an integral part of Syria's (semi-)arid climate and is not an exceptional phenomenon. Countries in the region such as Iraq, Israel, Jordan, Lebanon and Palestine were also affected by drought in 2007/8, but only Syria experienced a humanitarian crisis, with large-scale migration of populations and widespread malnutrition. I will argue that this can be explained by the fact that the humanitarian crisis in fact predated the drought. Similarly, climate change per se – to the extent that its predicted effects would already be visible – did not drive Syrians into the street in protest; it was the Syrian government's failure to adapt to changing environmental, economic and social realities. This seems to have become another test of climate allegiance: if somebody disagrees that climate change was integral to the formation of the Islamic State, they are a denier. 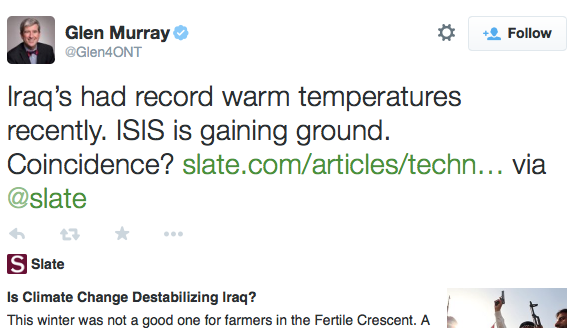 I am a denier - of the statement climate change was integral to the formation of the Islamic State.